Thank you very much to the Davidson family for allowing us to publish their family photographs of Frederick Baxter. Peter Davidson is the grandson of Elizabeth Kate Botting (nee Baxter), sister to Frederick and Philip. Thank you to Lenka Cathersides from Dorking Museum for the following research. 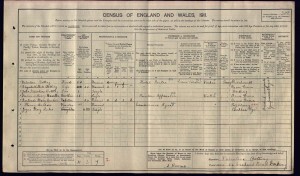 Frederick was born on the 25th of May 1895 in Beare Green. The son of John Baxter, Newdigate born and a blacksmith by trade, and his wife Mary Elizabeth who had been born in Norfolk and was about eight years younger than her husband. 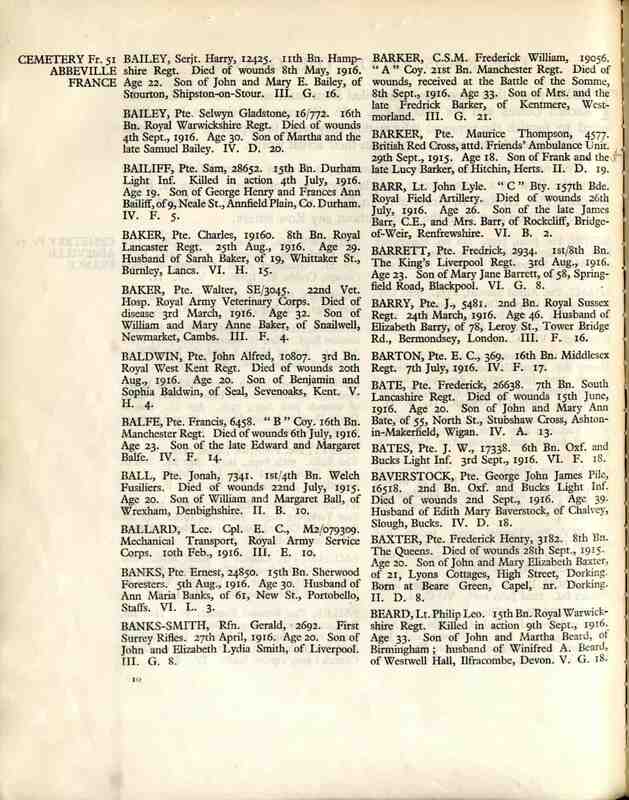 He had seven siblings: Emily Susan Baxter born on the 8th April 1881 in Holmwood; Isaac William Baxter born on the 17th of March 1883 in Dorking; Gertrude Mary Archer nee Baxter born on the 13th of October 1886 in Beare Green, Capel and baptised there on the 10th of April 1887; Elizabeth Kate Botting nee Baxter born on the 25th October 1888 in Beare Green; Hilda Margaret Russell nee Baxter born on the 18th of November 1890 in Beare Green; Philip John Wood born on the 19th July 1893 in Beare Green and Lilian Caroline born on the 19th July 1893 in Beare Green. 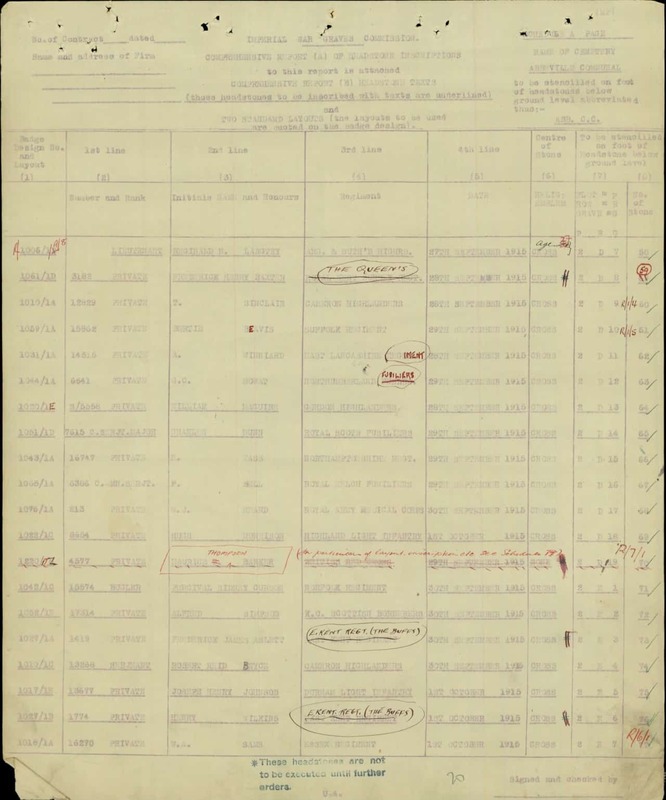 At the time of the 1901 Census, Frederick’s parents John, Mary Elizabeth and siblings Elizabeth Kate, Hilda Margaret, Lilian Caroline and brother Philip John Wood lived at 41 Orchard Road, Dorking. John was working as a blacksmith. 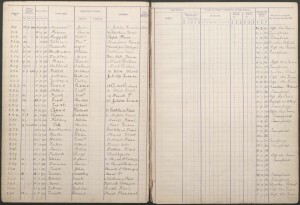 Frederick was admitted into St Martin’s Church of England School (for infants) in Dorking on the 9th of April 1902 and on the 20th of April 1903 was transferred into St Martin’s Church of England School (for boys) in Dorking. 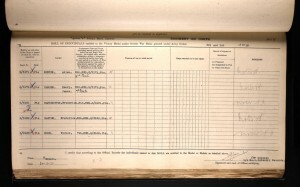 He stayed there until the 21st of May 1909. By 1911 the family’s circumstances had changed considerably. 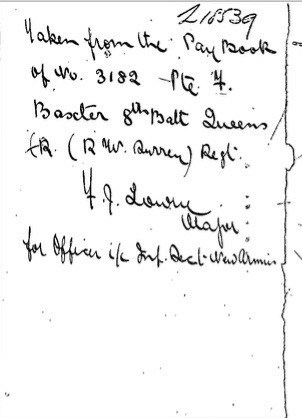 John Baxter had died in 1908 and Frederick was staying at 24 Orchard Road with his older sister Elizabeth Kate and her husband of two years, Valentine Botting, a hotel porter for licensed victualler, and named head of the household. At the time the couple had a son John Valentine born on the 21st December 1909 in Dorking. The house had 5 rooms. Before his Army enlistment Frederick was working for Mr. Balchin at Westcott. He was also a member of the Men’s Own Society. 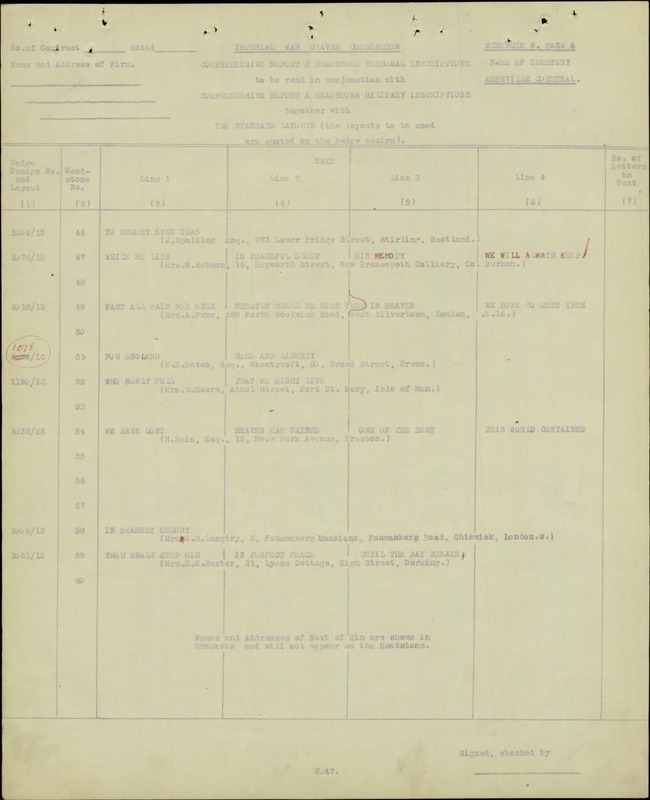 Frederick enlisted in Guildford on the 12th of September 1914. 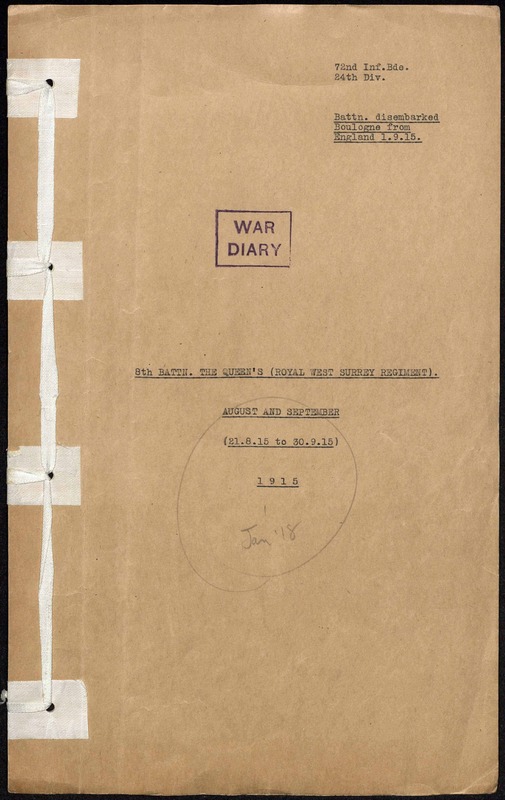 He became the part of the 8th Queen’s Royal West Surrey Regiment, he served with the British Expeditionary Force, disembarking in France on the 31st of August 1915 and seeing active service from the 1st September 1915. 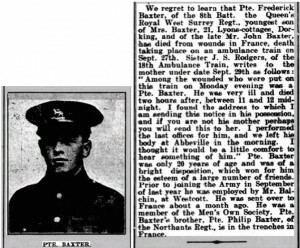 Frederick was severely wounded in the advance at Loos on the 26-27 September 1915 and died of wounds on the 28th of September 1915 in No. 18 Ambulance Train in France. He was put on the train on Monday evening and died two hours after, between 11 and 12 midnight. 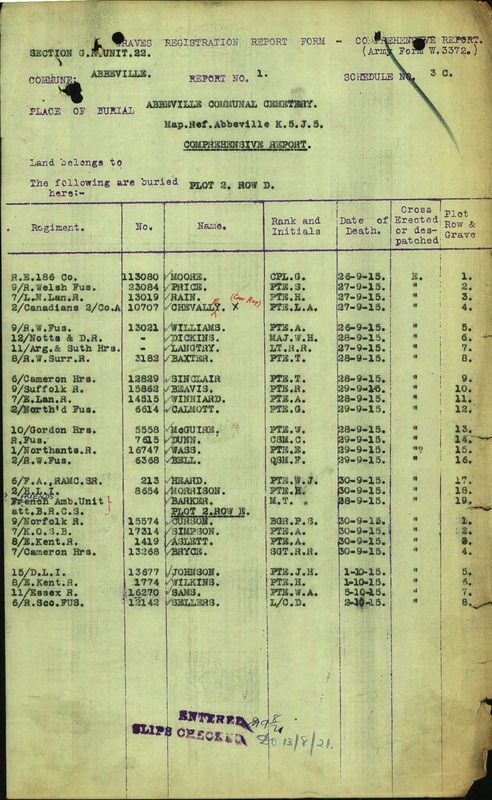 He was left in Abbeville on the morning of the 29th September and was buried at Abbeville Communal Cemetery. His grave reference is: II.D.8. His headstone reads: “Thou Shalt Keep Him – In Perfect Peace – Until The Day Breaks”. 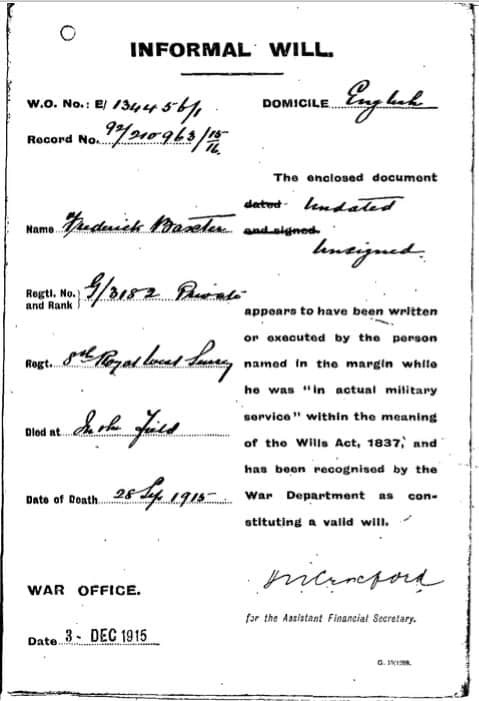 His mother Mary Elizabeth, as next of kin, was given soldier’s effects of £4 15s. 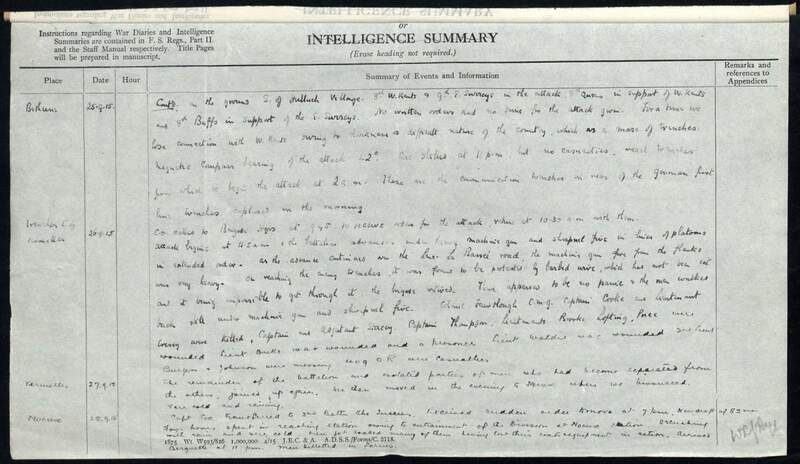 5d on the 8th of December 1915 and a further £3 10s on the 29th of July 1919. At this time she was living at 21 Lyons Cottages, High Street, Dorking. Frederick also left all his possessions to her in his will. 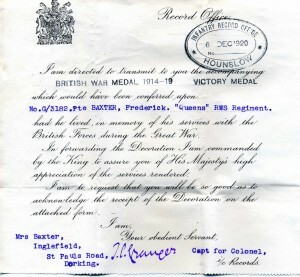 Frederick received the British and Victory Medals and the 1915 Star. 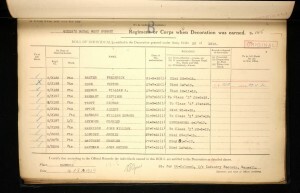 Sadly Frederick’s older brother Philip lost his life in the war and his name is also on the South Street War Memorial. 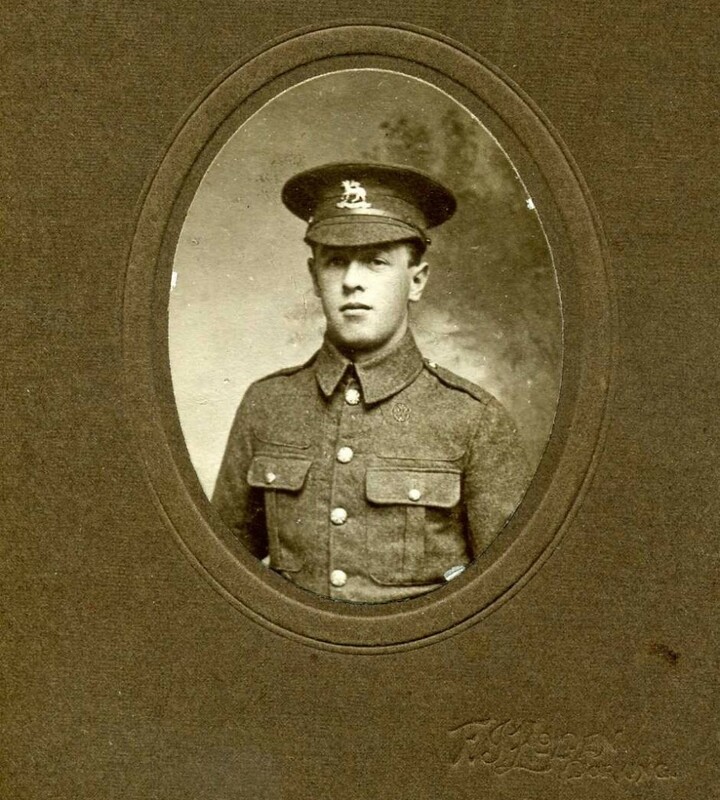 Philip too volunteered in September 1914, joining the 9th Cavalry First Hussars, but soon transferred to the Northamptonshire Regiment. He died at Carnoy in September 1916. 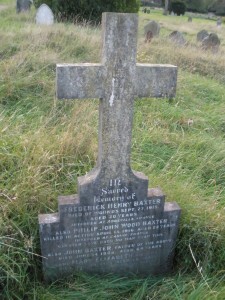 Philip John Wood Baxter and Frederick Henry Baxter‘s father was called John Baxter and was born on the 13th of April 1844 in Dorking, Surrey and baptised on the 12th of May in Newdigate, Surrey. He worked as a blacksmith. John died at the age of 64 on the 14th June 1908 in Dorking and was buried on the 19th of June 1908 in the Dorking Municipal Cemetery. 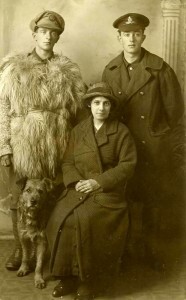 The boys’ mother was called Mary Elizabeth Stone. She was born on the 23rd of January 1856 in Norfolk and was baptized on the 19th of June 1856 at Saint John de Sepulchre in Norwich, Norfolk. John and Mary Elizabeth married on the 17th of April 1880 in Dorking. 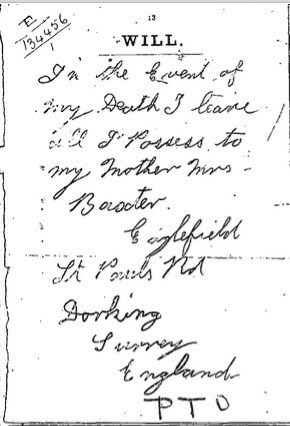 Mary died on the 27th of December 1924 at New Cottages Betchworth and was buried on the 2nd of January 1925 in Dorking Municipal Cemetery. At the time of her death Mary lived at Englefield, St. Paul’s Road, Dorking. She bequeathed £93 6s. 10d to her daughter Emily Susan Baxter, a spinster. 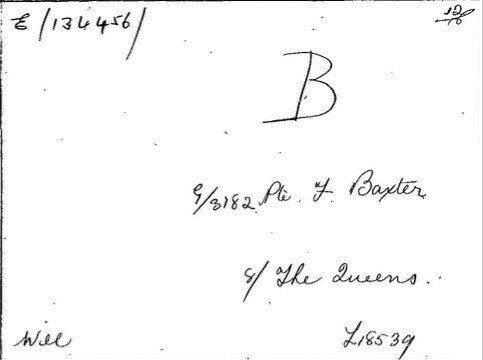 John Baxter’s parents and the boys’ grandparents were called Isaac Bag/Bagg Baxter and Susanna Baxter nee Wood. Isaac Baxter was born about 1819 in Hascombe, Surrey and was baptised on the 28th June 1819 in Hascombe. He was a master blacksmith of Beare Green and of Capel. Isaac died on the 11th July 1895 at home at Beare Green at the age of 76. 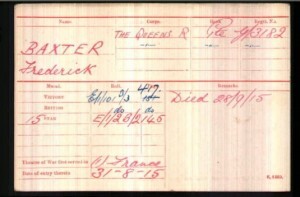 He was buried on the 15th of July at St John’s Church in Capel. He was in the blacksmith trade for nearly 50 years. 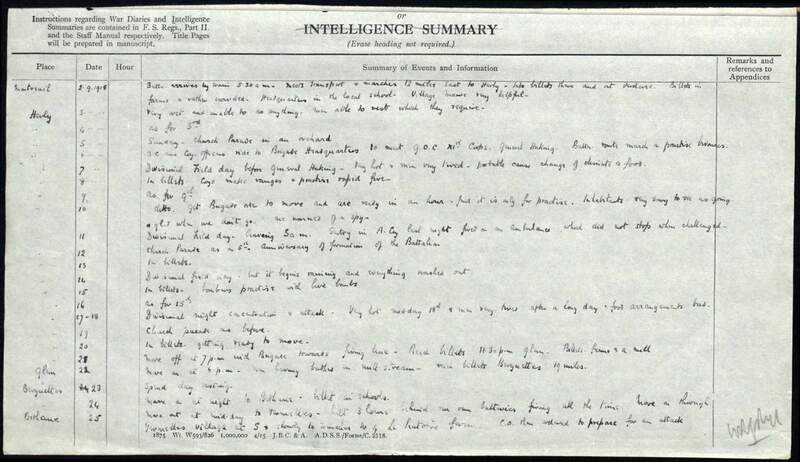 For the last 12 years of his life, Isaac was an assistant gamekeeper on the Lyne Estate. He was known to wear velveteen coats or smock frocks. When he was young he was also a fairly well known cricketer: described as an aggressive batsman and one of the fastest overarm bowlers in the South of England. Apparently, once a ball he threw knocked a bail from a distance of 40 yards. His residence faced the Beare Green Cricket Club; and after he retired from playing he frequently acted as umpire. Susanna Wood was born about 1812 in Capel. Her father was called John Wood. The couple married on the 15th of November 1842 at St George the Martyr in Southwark. At the time of the 1851 Census Isaac, Susanna and their children John, Edwin Horace and Isaac’s brother George lived at Buttery Cottage, Capel, Dorking. Isaac, John and George were working as blacksmiths. Isaac also employed an 18 year old apprentice called John Tickner. Susanna Wood died suddenly on Christmas Eve of 1865. 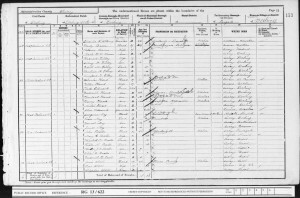 Mary’s parents and the boys’ grandparents were called Philip Stone born about 1835 in Arminghall, Norfolk and Hannah Stone nee Outlaw born about 1831 in North Tuddenham, Norfolk. The couple were married on the 19th of December 1855 in Norwich. 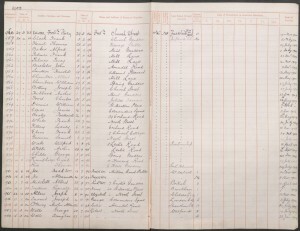 Philip could not write his own name and so placed a mark on the Marriage Register. At the time of the 1861 Census Philip, Hannah and their daughters Mary Elizabeth and Emily lived at Doris Lane, Norwich. Hannah was the head of the household. She was working as a dressmaker. Philip was a blacksmith.